"Health" can be defined as a state of complete physical, mental and social well-being, and not merely the absence of disease or infirmity. If we accept this operational definition, then "healthiness" has at least three basic components: physical, mental, and social.�Some may use a more metaphysical designation: body, mind, and spirit. "Health" has three basic parts, and the sum of these parts makes one whole. How can this dynamic state of wholeness be obtained? 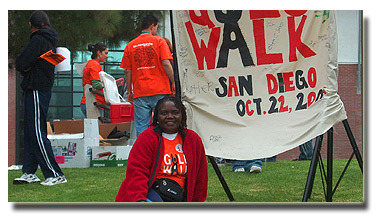 Gulu Walk in San Diego. This year's international Gulu Walk will be held on Oct 21st. The first step is to exercise. We should exercise regularly to keep our bodies physically fit. Many studies have shown that exercising 3 - 4 days per week for 20 - 30 minutes can drastically reduce our risk for heart disease, certain forms of cancer, and stroke; the three most common causes of death, respectively. Exercise in these studies included such activities as walking, running, biking, and gardening. Along with exercising, we should get 5 - 7 servings of fruits and vegetables per day, get 6 8 hours of sleep per night, drink plenty of water, and get regular medical and dental check ups. The second thing we must do is keep our minds active and challenged on a regular basis. Several studies have shown that individuals who participate in mentally challenging activities on a regular basis can delay the development and/or progression of dementia. There are many simple ways to keep our minds active such as reading books, puzzles, calculating your change in your mind before the cash register. Lastly, we must develop our spiritual beings. This can be done through prayer, meditation, fasting, participating in an active church service, maintaining healthy family and personal relationships. Some may be surprised that relationships are needed for spiritual well-being. But, true connection with another human being is a spiritual connection. Think about it. Every human being is the author of his own health or disease. The choice is ours to make. Will we choose "disease" or "health"? Dr. Richard T. Benson attended Fisk University in Nashville, Tennessee, where he received a Bachelor of Science degree in Chemistry. After working 1 year as a biochemist at Case Western Reserve Medical School, he attended Meharry Medical College where he received his MD degree and a PhD in Neurophysiology. His research thesis dealt with "Excessive Methylation in Parkinsonism". At Meharry, Dr. Benson received numerous research honors and was inducted into the Alpha Omega Alpha (AOA) National Medical Honor society. Subsequently, he completed a Neurology residency at the Harvard-Longwood Neurology Program in Boston, Massachusetts. Dr. Benson then completed a two-year Stroke Fellowship in the Neurological Institute at Columbia-Presbyterian Medical Center in New York, while completing a Master's degree in Epidemiology. His areas of interest include: health disparities, minority health, issues related to stroke and/or cerebrovascular disease, and translational research related to various neurological diseases. He presently resides in Washington, DC.